Photo courtesy of Burritt Bros.
One of Vancouver’s most enduring businesses, Burritt Bros. 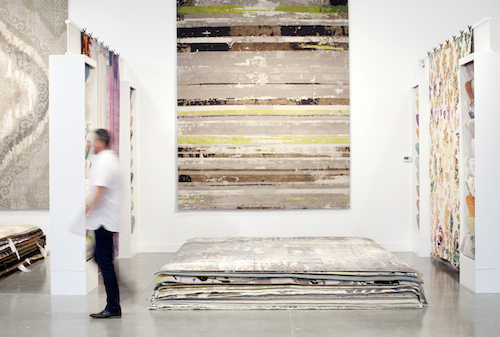 Carpet & Floors has announced its relocation to the up-and-coming interior design hub of South Vancouver. The company is marking the move to its new Fraser Street and SE Marine Drive home with The River Design Quarter Rug Collection, a series of rugs that celebrates the shared history of Vancouver and Burritt Bros.
Burritt Bros. is joined in the new location by Colin Campbell, providers of fine flooring to the design and architecture trades. The two shops sit side-by-side with a stunning showroom, offering retail and trade customers an unparalleled selection of high quality, high fashion floor coverings. The spacious showroom boasts soaring ceilings, a flood of natural light, and an artfully displayed collection of fine area rugs, carpet, and hardwood flooring. The first Burritt shop on Hornby. Photo courtesy of Burritt Bros.
Burritt Bros. has a longevity that is rare in Vancouver. The company was founded in 1907 by Ed Burritt, grandfather of current co-owner, Harvey Burritt, and the company’s story is interwoven with the city’s history. Over the past century, Burritt has covered the floors of the city’s most iconic buildings (including all three incarnations of the Hotel Vancouver, the Marine Building, and the Orpheum Theatre), laid linoleum on troop ships in World Wars I and II, and installed flooring in countless family homes throughout Greater Vancouver. The River Design Quarter Rug Collection includes the Aerial ‘48; a rug that celebrates Burritt’s new home on the Fraser River. The rug was inspired by a City of Vancouver archival photo depicting the 1948 flood of the Fraser, with farms on either side, absent of any of today’s industrialization. The rug pays homage to the mighty Fraser, which has powerfully shaped the region’s geography and economy but is rarely celebrated. The full River Design Quarter Rug Collection is on display online www.burrittfloors.ca and at the Burritt Bros. shop in South Vancouver. The new combined showroom and offices are located in the River Design Quarter at #60 (Burritt Bros.) and #55 (Colin Campbell) 8385 Fraser Street in Vancouver.